3DS enhanced port currently 80 percent complete. The story volume of Digimon World Re: Digitize Decode, Namco Bandai’s upcoming 3DS port, will be twice the size of last year’s PSP original, this week’s Famitsu reveals. 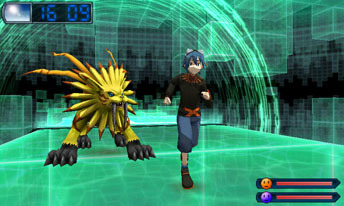 The game will add a large number of popular Digimon after tallying up a survey from people who bought the PSP version. It will feature over 160 Digimon. And if the bosses are included, the total is above 200. Decode Level: Train your Digimon to draw out their max potential. Degitta: Quickly access news from the Digimon world. Additional changes in the 3DS version include game balance revisions and dual-screen support. Decode is currently 80 percent complete. It’s due out for 3DS this summer in Japan.